I sort of can't believe I haven't told you guys about this recipe already. 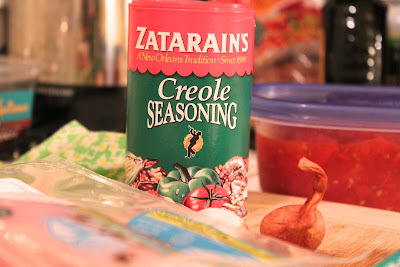 Particularly considering that it's become one of my husband's favorite dishes of all time. 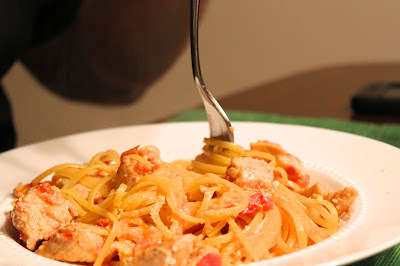 He says it tastes like something you'd get in a nice restaurant, and that it's his most-loved Italian-ish thing I make. I have Eat Live Run to credit for this, once again. You can bet your bippy I'm buying her cookbook when it comes out. It thrills me a little bit that she lives in the wine country, just a couple hours north of me. The true beauty of this recipe is that it involves only a handful of ingredients and takes about twenty minutes to make. 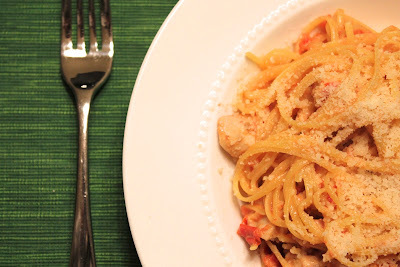 Pasta, cream (don't worry -- you only use 1/4 cup), chicken breast, shallot, garlic, diced tomatoes, creole seasoning. Please ignore the drying dishes on my counter top. Space is at an all-time premium in my kitchen right now. I sense a major cleanup/reorg coming soon. 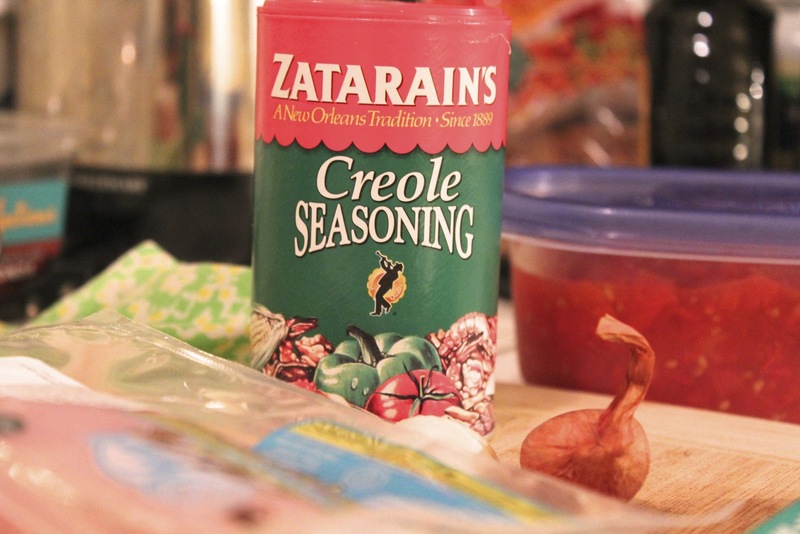 Another beautiful thing about this recipe is that you use creole seasoning. I don't know about you, but I bought this stuff to make God knows what one time, and never used it again. Well, it's a true gem in this dish. While your pasta is boiling, you just saute your chicken with some seasoning, then remove it from the pan and cook your shallot and garlic. Then dump in the tomatoes and cream, and a little more seasoning, simmer for a couple minutes, throw the chicken back in, stir in your pasta, and DONE. It's not an overly-saucy dish, and might not look like much in the picture. You'll have to take my word for it that it's basically the bomb. It's a complete miracle that I have leftovers that I get to eat for lunch today. I normally like a very saucy pasta, but this is the exception. Besides, each noodle is well coated with this delicious concoction. 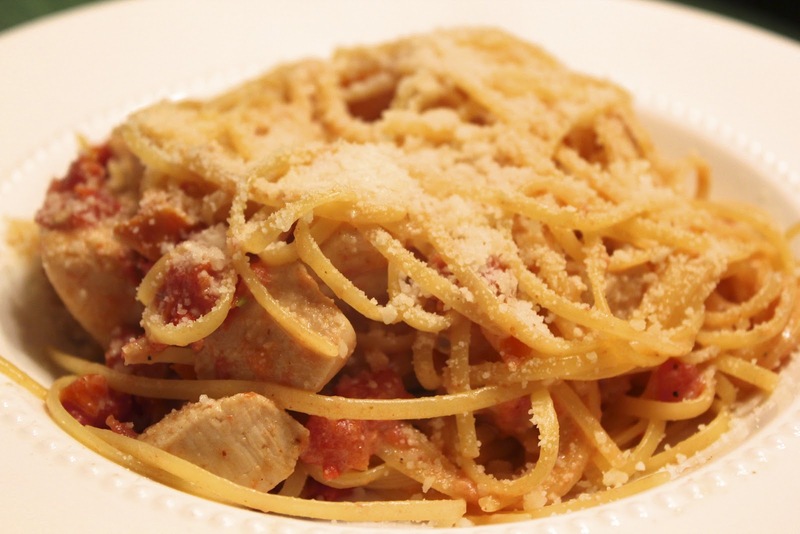 I've also renewed my love affair with grated parmesan -- the powdery kind. It's delightful. My husband preparing a forkful. He really, really loves this dish, and he has a rather trustworthy taster. I'm just glad he likes something that's so easy and quick to make. If you haven't checked out Eat, Live, Run yet, you should. Click here for the recipe. And have a great St. Patty's Day! I plan to post photos next week of our Corned Beef Feast. This sounds super good - how could you go wrong with that ingredient list though? Also: I love quinoa pasta. 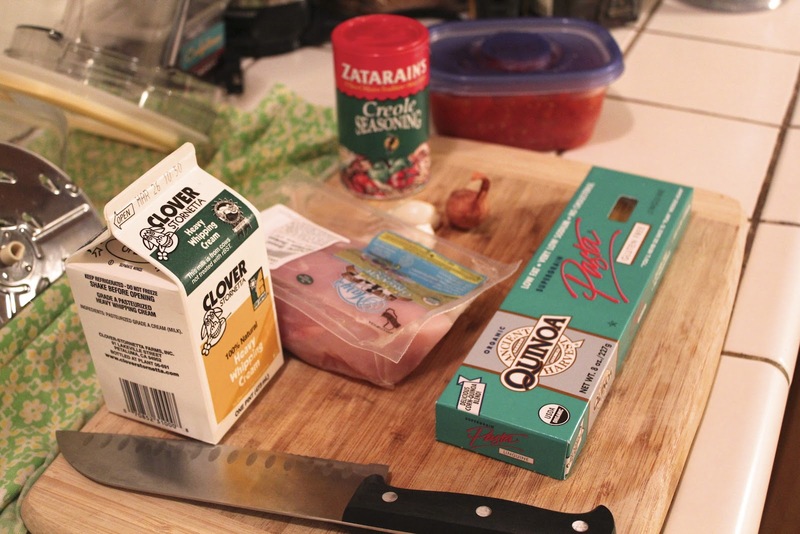 How's the quinoa pasta differ in taste annd texture? Chris - This particular brand of quinoa pasta is excellent. It tastes just like regular pasta and the texture is spot-on, too, not pasty and squishy like rice pasta.